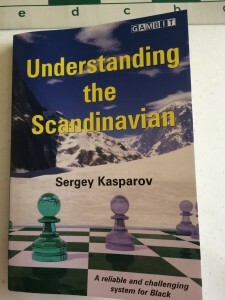 by GM Sergey Kasparov is the latest addition to chess literature on this popular opening system.The book is developed around the current trend in the Scandinavian system, named the 3…Qd6 variation. The author also covers the 3…Qa5 and the 3…Qd8 variations respectively. 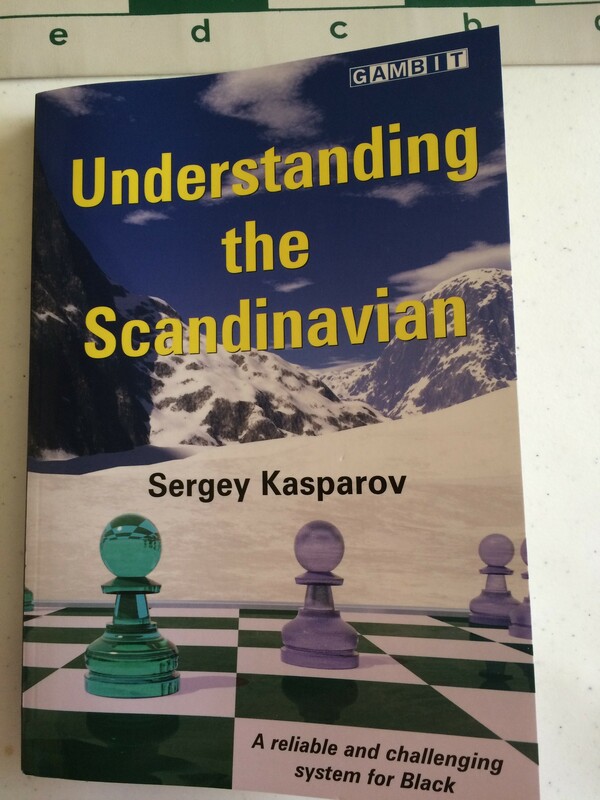 The Scandinavian with 2…Nf6 is also discussed by Kasparov in this book, although the positions arising after 2…Nf6 are of a different nature than the positions after 2…Qxd5. The main premise in this book is to show the reader the thematic ideas and plans that emerge from the Scandinavian in a clear fashion without sacrificing analysis. 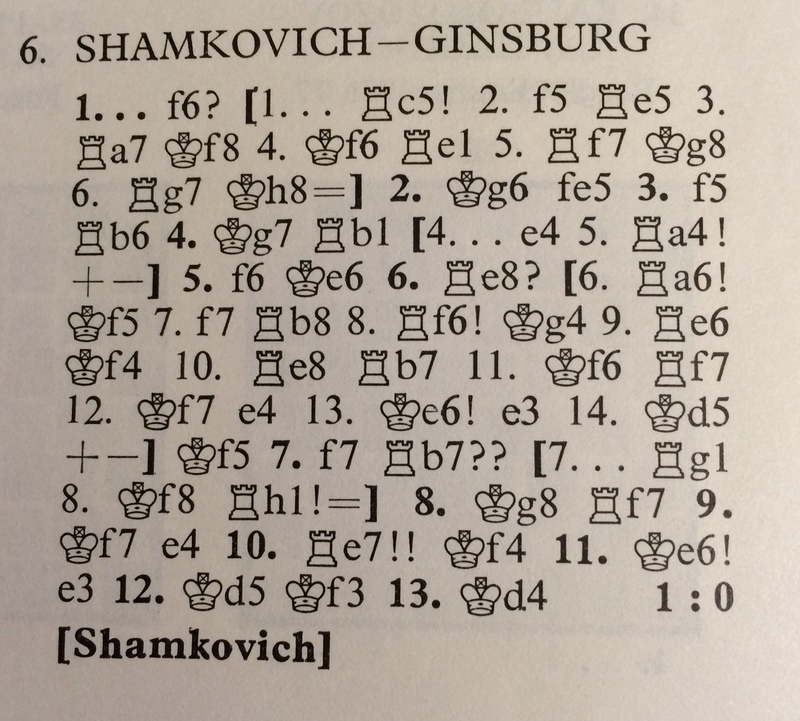 Chess books usually reflect the shift in opening fashion. In the Scandinavian, we can track the dominance of the 3.Qa5 variation to the work of Bent Larsen in the 70’s including his amazing victory over Anatoly Karpov in Montreal (1979), followed by the publications of high quality books on this opening such as the Modernes Scandinavisc (2002), Play the Scandinavian by Bauer (2010), and the Modern Scandinavian (2011). In 2010 the theoretical landscape of the Scandinavian started to change after Sergey Tiviakov was crushed on the White side of a 3…Qd6 Scandinavian and started defending the Black side of this opening! . In the following decade, Tiviakov single handed popularized the Qd6 variation and contributed extensively to its development to the point that this variation become the main line of the Scandinavian. In my opinion, Kasparov’s book is the first high quality book that place the Scandinavian Qd6 as the main line of the Scandinavian system. In Understanding the Scandinavian, Kasparov states that the popularity of the 3…Qd6 variation is because Black is under less pressure than in the 3…Qa5 and 3…Qd8 variations and I agree with this appreciation. As expected, the core of the book is the Qd6 variation, followed by the Qa5 variation and the Qd8 (covered in two pages). The material follows a logical sequence and the explanations are clear. I was very impress by the way the author combine whole games with game fragments (usually a chess books only uses one format, but not both). 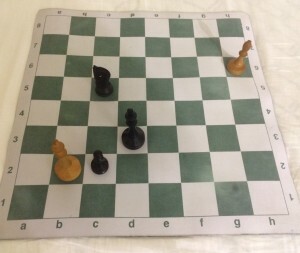 To make combine a whole game with relevant game fragments the author needs, first a great command of the subject (practical experience), second , the knowledge of a great number of games played over a long period of time and finally, the ability to use pawn structures to anchor the analysis. In this case Kasparov uses the restrain pawn structure (e6 and c6 versus pawn on d4) to explain the dynamics and transformations of positions emerging from the Scandinavian. The Book is a good read and I recommended it. My only criticism is about how the author uses the space in the game Kasparov vs Anand (game 14 Wch 1995). The author used most of the space available to analyze the options between move six and eight at the expense of one the most amazing Scandinavian middlegames games ever (in my opinion).This book is available at Amazon. by Matthew Sadler and Natasha Reagan is a very special book because of its content, form and author’s background. The authors explore and deeply researched how chess skills develop and change over time following thirteen players (I would say fourteen if we include Sadler in this list). 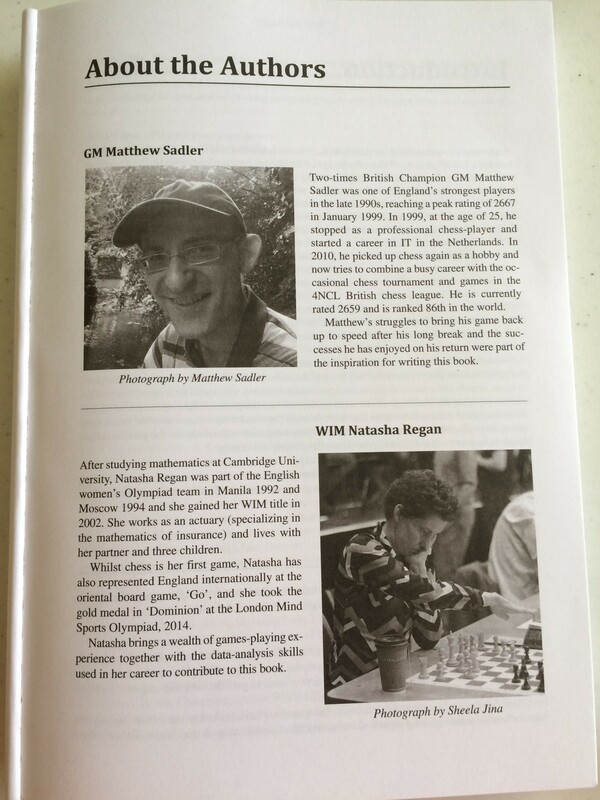 The central point of the book is to show how the role models adjust their approach to chess to stay competitive after passing the forty years of age. Each chapter is devoted to a player and his/her approach to chess is dissected by looking at their opening repertoires and the type of positions that they aim for out of opening. In most of the cases the role model is an example of efficiency in winning games in open circuits, with a minimal expenditure of energy, with the exceptions of J.Polgar, Seirawan and Capablanca. Chess for Life is develop around eleven interviews and a discussion of Capablanca and Tony Miles approach to chess in their late years. The authors show how chess players that remain competitive after reaching their peak have very well crafted opening repertoires. The opening repertoires are dissected with the help of databases and the results are summarized in a table. As an amateur, I learnt that a coherent, flexible and narrow repertoire is the key to stay competitive as we age. The opening repertoires provided by the Sadler and Reagan can serve as “templates” for the reader that want to change his/her opening repertoire but do not have the means to pay a professional to do it for him. The interviews are complemented with games that illustrates the topic under discussion, but are not saturated with variation after variation (even the complex games of John Nunn!). The role model in each chapter provided their personal view of chess as they become older, how patient and other skill sets compensate the decline in calculation power. I really liked how my favorite players from the 90’s such as Nunn and Speelman gave the reader a glimpse to what happened to a world class player after they pass their prime. For example, I always considered John Nunn a Mathematician that was really good at chess, but to my surprise Nunn does not do any math today, but still playing chess….. 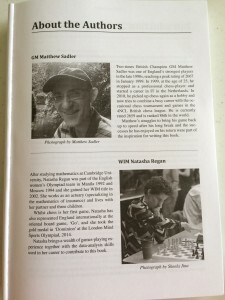 The main asset of Chess for Life is the people responsible for the project, the author and editor Graham Burgess. Sadler and Reagan bring to this project valuable experience as chess players that at some point in life (like most of amateur players) chose to follow a non chess related profession and returned to the game successfully. The authors pour their experience into the book, not only the sweet wins, but the bitter defeats. It is illuminating how Sadler demonstrates that a proper “1.d4, 2c4, 3Nc3 repertoire may become a major liability over the years. As the book editor, Graham Burgess makes the content to flow smooth and contribute to the evaluation of some games previously analyzed in professional type publications (no an easy task). by Karsten Muller and Yakov Konaval is a book that merges the massive amount of information coming from the six men tablebase with human interpretation. The premise behind this book is that by combining human interpretation of computer generated data, chess players can improve their chess skills. 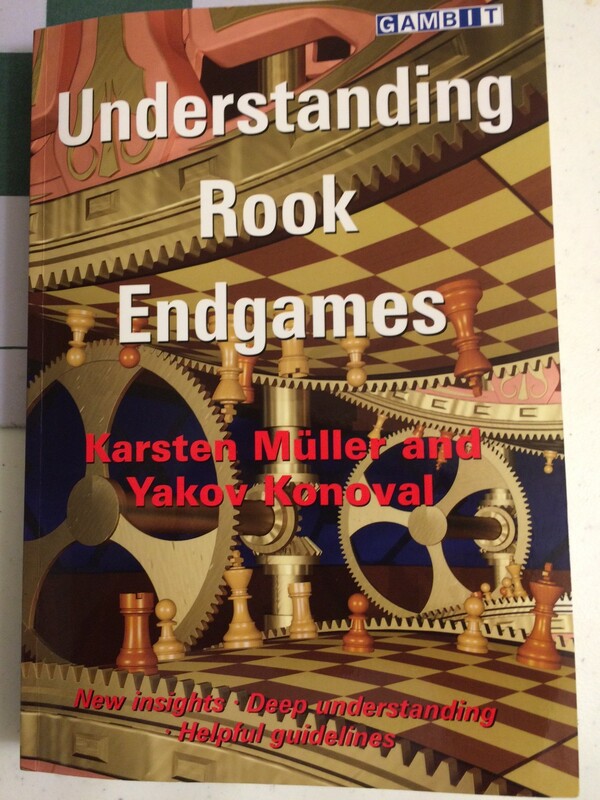 A player reading and working his/her way through this book (or even just the first four chapters) will evaluate better the transition to an endgame to convert an advantage or to defend a difficult/lost position. In the first case, the player holding the advantage wants to transition to a clear win at the time that defensive stalemate ideas or fortress are avoided. In contrast, the player on the losing end wants to play a long endgame in which the distant to conversion (DTC) and technical difficulties to convert may provide drawing chances. 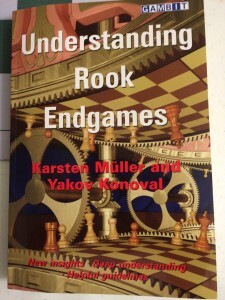 The first chapter of the book is devoted to fundamental rook and pawn endgames for club players. The reader needs to master the content of chapter one for two reasons. First, the material in chapter one is a pre requisite to tacking more complicated endings in later chapters. Second, according to the authors the positions in chapter one is part of the group of key position in the whole sphere of endings theory. The basic five positions (and how to play them) explained by the authors in chapter one are the Philidor, Lucena, Tarrasch, Karstedt and Vancura position. In this chapter the metric DTC is introduced and explained. A chess player looking to improve his/her chess skills above the 1000 USCF mark needs to develop his tactics to new levels. 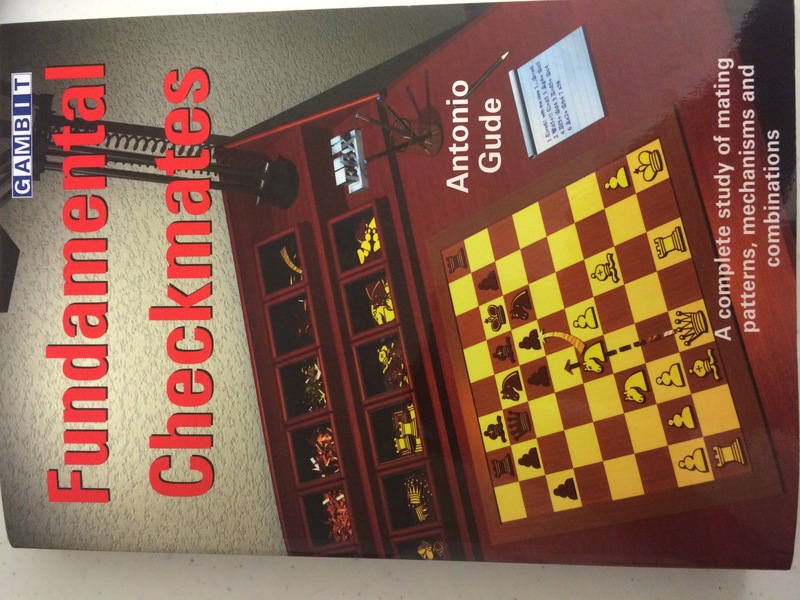 The book by Antonio Gude cover s three key aspects of chess tactics, named matting patterns, tactical devises and combinations that will help a player to move above the 1000 rating rank. In this review on I will look at three aspects, content, originality and value to chess players aiming to reach the USCF 1200 -1400 Level. Antonio Gude a well know author in Spanish speaking chess circles and several of his books such as A complete Chess Course were translate to English by Phil Adams and published by Gambit. In Fundamental Checkmates Gude divides the material in four parts. The book starts with First Steps a kind of introduction followed by Matting Combinations using two pieces, Target the King in the Center and finally, Target the Castle King. The author provides three hundred and seventeen training positions as advertize on the book back cover. The training positions help the readers to cement their newly acquired tactical skills. The training positions are divided in three sets as follows. The first set (135 positions) appears at the end of part two. The second set of positions (65 positions) pops up at the end of part three and the remaining positions (112 puzzles) are located at the end of the book. Based on my experience, the examples in Fundamental Checkmates are original because only four games out of all the positions in the book were familiar to me. 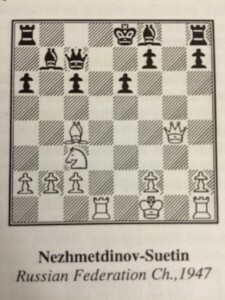 The first position I recognized in the book was Zapata- Anand, Biel 1988 (Modern Chess Miniatures by Neil McDonald, page 9) followed by three classic chess games very well know, Liu Wenzhe- Donner, Buenos Aires Olympiad 1978 (a classic game in the study of the Pirc defense), Letelier- Fischer, OL 1960 (A classic game in the Kings Indian defense) and one of Morphy’s games (presented in Gude’s Complete Chess Course mentioned above). The author made substantial efforts to provide examples that systematically rise in difficulty as the book progresses. More importantly, the examples presented by Gude do not require pages and pages of analysis to make the pattern behind the sacrifice clear to the reader a clear example is the game Rogers vs. Muljadi in page 322. In this position, Gude shows how the tactical pattern learnt previously, such as confining the King to the edge are the goals of each of Rogers’s sacrifices. A complicate sequence is explained blow by blow in simple terms. As a trainer, I try to evaluate the potential of every chess book I read as a training tool. The key question is how the content of this book fits into my chess program? Fundamental Checkmates, provides the ambitious student with the chess knowledge require to move up the 1200 USCF mark. The content of this book also help the student to tackle more advance tactical publications and improve on his/her own. 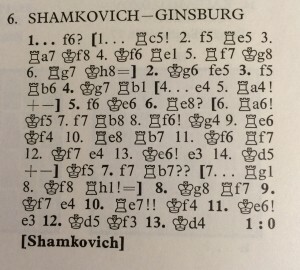 For example, after a chess player becomes familiar with the content of Fundamental Checkmates reading a book such as Attack with Mikhail Tal (Tal and Damsky, 1994) is easier and less frustrating. 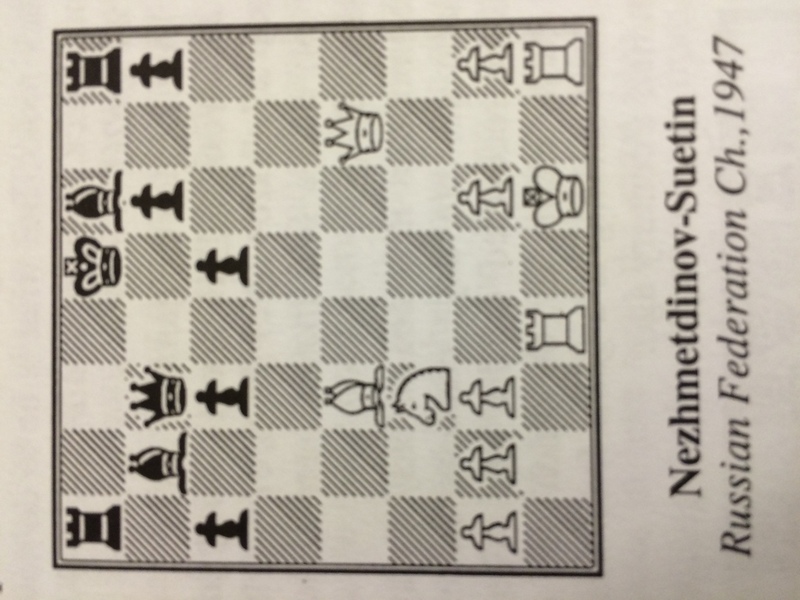 Let’s take the game Nezhmetdinov- Suetin, 1947 after the move 16 by Suetin (see picture). After 17. Bxe6 fxe6 18.Qxe6 Be7 the author provide the variation 18…Qe7 and if 19.Qb3 Bg7 20. Rg1 (but not 20.Re1 Be5 21 Re5 Qxe5 22. Qxb7 0-0 and black has the advantage). A sharp eye will notice that after 20…Be5 21.f4 wins the pinned bishop. Why the authors did not mention the variation? Well because after 21…Rf8 Black counterattack with a pin against the White King that may end with a matting sequence. The matting sequence in the variation above is similar to some of the training positions and examples in Fundamental Checkmates. In other words, a chess player that goes through “Fundamental Checkmates” can fill the gaps left by authors of advanced tactical manuals or books. More importantly, the player with a solid tactic foundation can continue his/her own education going over master games of the great tacticians of the past like Rudolf Spielmann. 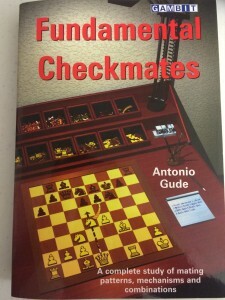 Finally, as mentioned before Fundamentals Checkmates is the English translation of the book, Tecnica de la Combinacion de Mate published by Tutor editions in 2000.Phil Adams did a great job with the translation of the book from Spanish (my first language) to English. Adams improves the fluency of the text by omitting comments that make sense to a Spanish speaking person, but will leave an English speaking person scratching his head. For example, in the game Yasseem- Lobron, Dubai 1983 (page 322) at the end of the game the text reads “The United Arab Emirates promotes chess quite considerably in the 1980’s, notably their brilliant organization (in 1986) of the Olympiad in their capital, Dubai”. In the book in Spanish (page 382) the text continues with “deserving being happy”. 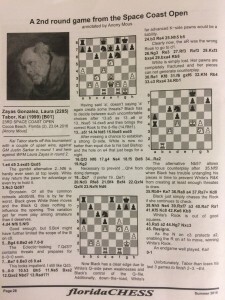 The comment makes sense in Spanish, but in English the comment will be difficult to understand because the game is played in 1983 and then the author mentions the Olympiad in 1986. Fundamental Checkmates is a valuable contribution to the chess literature. Players and trainers will find plenty of high quality material to improve their chess skills and teaching files respectively. Recommended! One of the main problems for every amateur chess player is putting togeher a sound and coherent opening repertoire. Most of the time the opening repertoire of amateur players is a patchy collection of unrelated or trappy variations that seriously hinders creativity and chess progress. Why a chess player will chose a subpar opening repertoire voluntarily? The main reason is lack of gidance or will power to do a serious and sustain effort to play a line that fight for the advantage for white or provides black with a fighting chance against white main openings. I am not avocating to play mainline exclusively, because that is an epic task for the amateur, but at least to use an opening repertoire that promotes chess improvement and increase the overall undertanding of the game. An opening repertoire needs to fit the player skill level, personal preferences/style and do not consume all the time an amateur player has available for chess. For example, playing the sicilian Najdorf as black will consume a big chunk of a player’s chess time and will not guarantee sucess over the board. In the same line of thinking an agressive player will be out of his element playing the London sistem as white or the Caro Kan as black because the resulting middlegames from both openings are anything but open or tactical. Finally, if a player decide to play 1.e4 as white what is the best option to build the opening repertoire that is sound, coherent and will expand the player’s chess horizon? 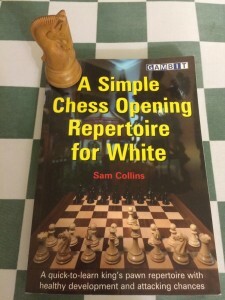 I think that one of the best option in the market of opening repertoires tailor to the busy but ambitious amateur player is Sam Collins book:. Sam Collins develops his opening repertoire around the isolated d pawn structure against the Sicilian (2.c3), French(3.Nd2, aiming to play with an isolated d pawn) and Caro Kan(2.c4), The Italian versus 1…e5 and restriction of black options in the minor lines such as Pirc/Modern and d3 against the Scandinavian. The main values of the suggested choices suggested by the author in this book are the following. 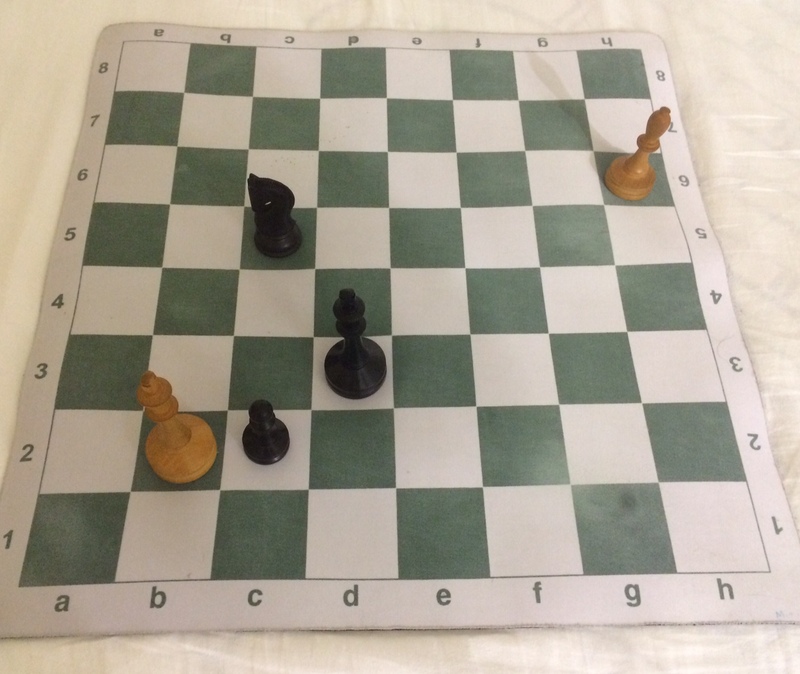 First, against three of the more popular openings at club level, the author builds a repertoire around a structure, the isoladed quee pawn (IQP). Second, the author explains how to play with an IQP, but more importantly, Collins is realistic about the attacking chances for white in the middlegame and the amount of tactical skill to press for the win. Third, the choices against the minor lines with 3.Bd3 are eal time savers that do not surrender the initiative to black. After the opening, to my surprise I got a clear advantage, but the game ended in a dramatic fashion because from the position in the picture . 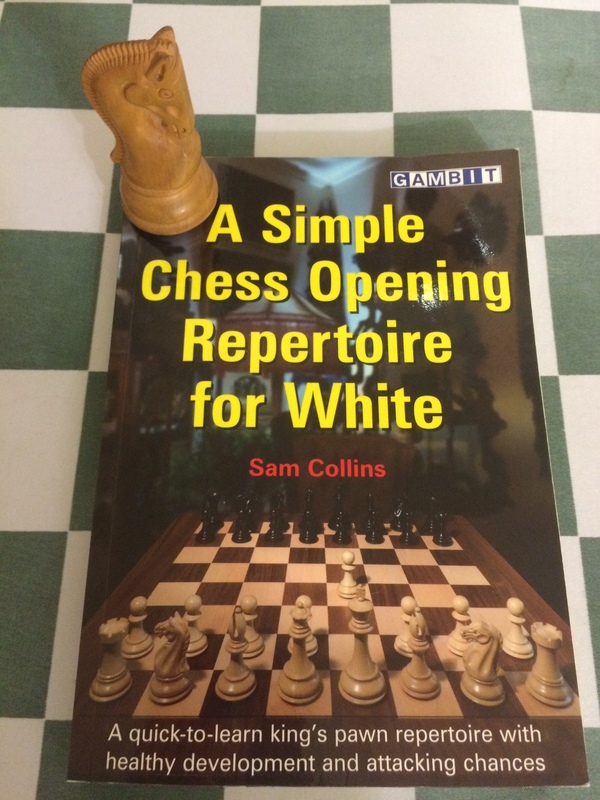 In summary, A Simple Chess Opening Repertoire for White by IM Sam Collins is a worthy addition to the openeing repertoire books on the markek. This book is highly reccomended to players looking to expand their chess horizon playing IQP positions coming from 1.e4. As a bonus the size of the book is perfect to bring it with you to tournaments and refresh your opening lines between rounds, although, I prefer the ebook option available at the Gambit App store. Lajos Portisch My Secrets in the Ruy Lopez is a glance to the black leather bag carried by Portisch as mentioned by Larsen and Levy. 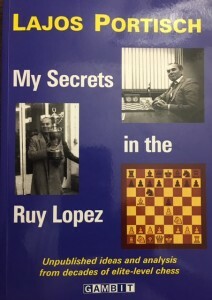 In this book the author shows to us how a world class player approach opening preparation, the influence of the competitive background in the decision making process, the evolution of opening variations over the years and when the choice of a computer is not the first choice of a top grandmaster. The book starts with a story about the author and Bobby Fischer which makes a great introduction to the rest of the material. It is well known that Fischer advocates at some point in his career the exchange variation of the Ruy Lopez and Portisch uses this introduction as a tribute to Fischer and to start the discussion on the Ruy Lopez. 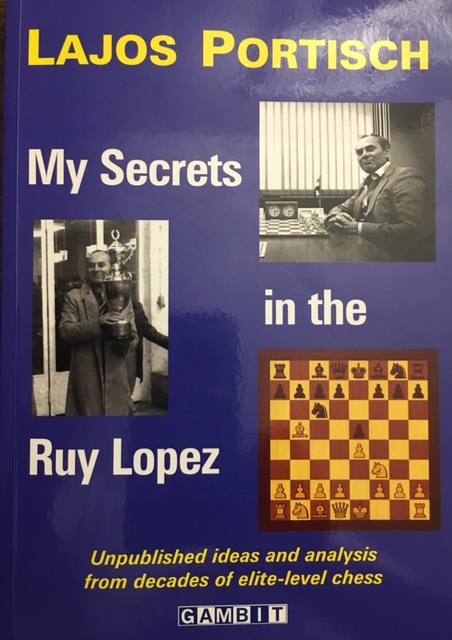 It is worth to mention that the book covers the Ruy Lopez according to Portisch’s praxis, so variations like the Berlin Wall that are not of the author liking are not discussed in this book. What strike me the most was the first and second game in the book (Fischer- Portisch, Havana 1966) and (Barendregt – Portisch, Amsterdam 1963). Usually, chess authors start “strong” presenting a game won brilliantly by them. In contrast, Portisch start with a game that makes perfect sense from the explanation of the material by that ended unfavorably to him. This two game set the tone for the rest of the book. Portisch will organize the material in the most logical order, regardless of the result of the game. I also found the transitions from variation to variation very elaborated and useful. 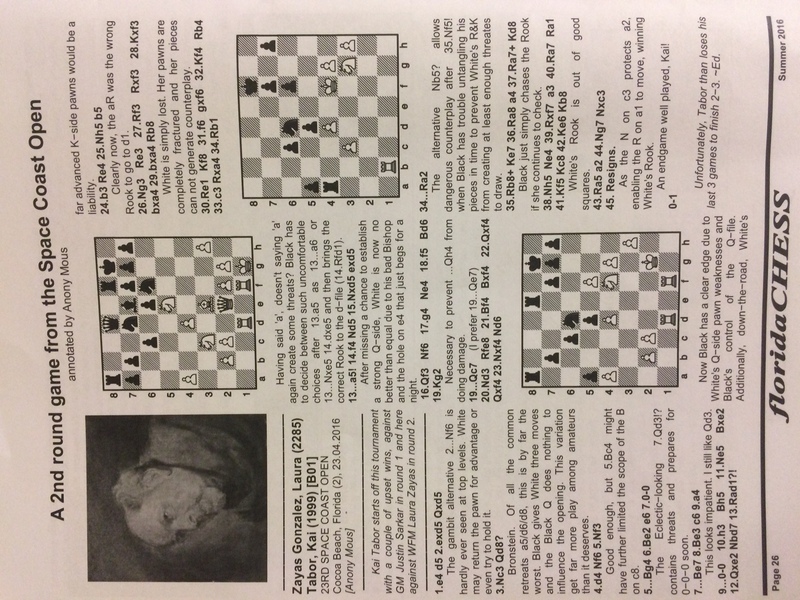 For Instance, in game 30 Zorko – Beliavsky, Ljubljana, 2011, after summarizing the variations with 3…Nf3, Portisch introduces the 3…a6 with an enlighten comment about the Open Ruy Lopez versus the Closed Ruy Lopez at the amateur level, this time Portisch cited Larsen, despite not agreeing completely with the Danish GM. Again, the author puts the reader before him. The book is not self-indulgent is a very objective piece of work that despite being written but one of the top Hungarian players is amateur friendly. To finish this review, I want to take the opportunity to mention how important the work and opening analysis of Lajos Portisch have been on the World chess scene. For example, let’s take the game seven of the match Korchnoi – Karpov, Baguio 1978. In a Nimzoindian, Rubinstein Variation, Korchonoi uncorks 6.d5 and Karpov replies b5, a sharp choice considering Karpov’s style (as pointed out by Portisch in this book, Karpov takes pawns rather than sacrifice them!) Why Karpov was ready to play b5 and sacrifice a pawn? Larsen pointed out in his book The World Chess Championship 1978, page 53, that Karpov found an improvement on the game Donner – Portisch, Beverwijk, 1968. In this game Portisch played b7-b6 and later b5, that is the right idea in the position, but it is more effective when black plays b5 in one move. 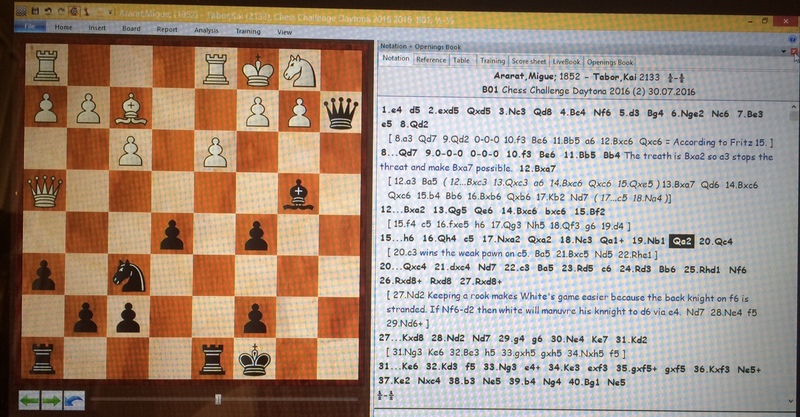 This examples shows that even the very best like Karpov, took note of Portisch’s opening play. This books may be read as an opening effort, but in reality is a window to the secret lab of one of best analysist/strategist in chess. It is a great opportunity to read Portisch taking in first person and making easy to an amateur to understand otherwise complex opening theory/evolution on the Ruy Lopez. Warmly, recommended. The Sicilian is a fast pace moving opening and the amount of theory around it is gigantic. As a coach I recommend my trainees (as black or white) to play over 10-15 games on a Sicilian variation before committing to play it. The idea is to be sure that the resulting middle game positions are of his her liking and fits his skill level. For example it is easier to start playing a Sicilian e6- a6 than a d6-g6 (d6-a6) Sicilian. The next step is to find a good source of Sicilian games with explanations and focus on ideas without being over simplistic and ignore critical variations. In the past a good source of Sicilian games was The Sicilian Defense by Eduard Gufeld (1986), then we have a more complete series of books at the beginning of the new millennium like The Sicilian Sozin by Mikhail Golubev (Gambit 2001) followed by Rogozenko’s book on the Anti Sicilians (Gambit 2003, with Golubev cited at the end of the introduction) and experts versus the Sicilian (Quality chess). As the reader can guess, a new book on the Sicilian amateur friendly was a pressing need. Fortunately, by Mikhail Golubev was released recently by Gambit publications. 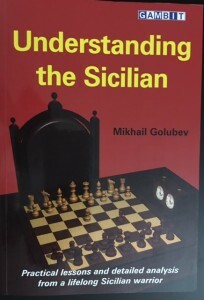 In Understanding the Sicilian Mikhail Golubev offers the reader a concise overview of the Sicilian defense and the most common anti Sicilian alternatives to white. The potential buyer needs to be aware that Golubev account of the Sicilan in this book does not cover the Bg5 Najdorf, Classical Scheveningen or the Rauzer versus the classical Sicilian. That being said, The book combines a rare blend of quality content, practical advice and efficient format. 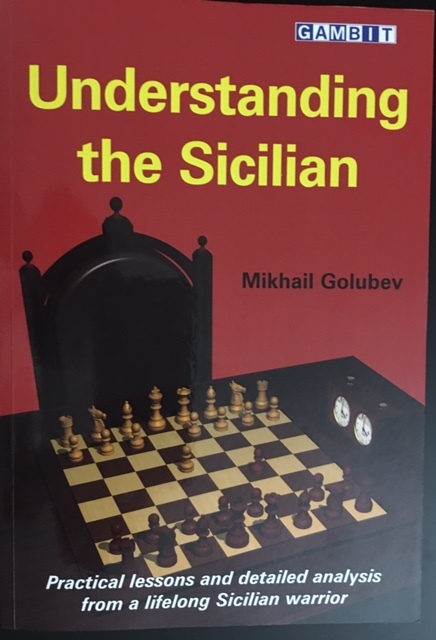 This is not a surprise if we take into consideration that M. Golubev is an experience chess journalist and Sicilian practitioner (the book has Golubev on both side of the Sicilian). Quality in Quality out. That being said, the book is the right size and weight to be carry around and the binding, pages and type setting makes easy to read and differentiate the main game from the analysis branches. The author uses one hundred and twenty games to give the reader a .theoretical update including slippery move orders. For example, In the Fischer Attack featured in game 111 between Golubev and Shishkin, Bucharest, 2006. The authors points a subtle difference in the move order that is critical to white. After the move sequence 1.e4 c5 2.Nf3 Nc6 3.d4 cxd4 4.Nxd4 Nf6 5.Nc3 d6 6.Bc4 Qb6 “This game featured a very different move-order that never less led to a position better known via 6…e6 7.Be3 a6 8.Bb3 Qc7 9.f4 Na5!? And now 10.0-0. However, in that sequence, castling is not the more challenging move for Black 10.g4!? Is playable, while 10.f5! Is probably the most critical”. Only a player with a lot of experience can condense that amount of information in a few sentences without taxing the reader with a realm of variations.Golubev also give you the way out of forcing lines even in the Sozin (in which I consider Golubev a specialist). For Instance in game 95 Golubev- Lupulescu, Bucharest, 2002. After the sequence, 1.e4 c5 2.Nf3 Nc6 3.d4 cxd4 4.Nxd4 Nf6 5.Nc3 d6 6.Bc4 Qb6 7.Nxc6, the authors recommends and explains 7.Nde2 as a less forcing playable line for white. I like this book because despite the complexity of the subject the author offer a practical approach at important junctions in the book. For example, About the Morra Gambit, Golubev recommends not to take the pawn and explain that white compensation for the pawn is sufficient and that if black tried to refute the gambit by taking the gambit pawn that will be a poor investment of time. I agree with the author and find his recommendation a time saving gold nugget for the aspiring amateur willing to take on the Sicilian. At a higher level, I found Golubev’s suggestions such as 8.Bg5 in the Fischer Attack (game 106) lines as being test by the chess elite in recent games. Recommended, a high quality work! Chess books are written by chess players of different strength and understanding, but the key point to judge their work is to test if the target audience can benefit from the book. 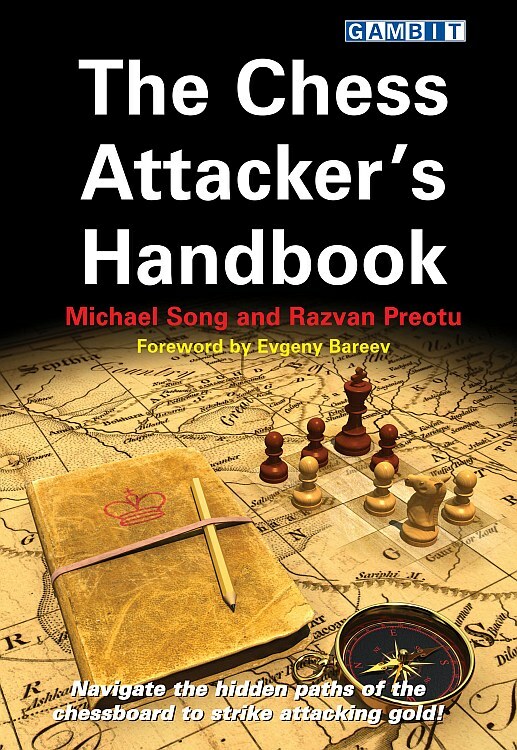 The Chess Attacker’s Handbook by Michael Song and Razvan Preotu, is an endeavor to help intermediate players to prime their attacking chess skills. 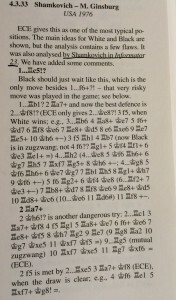 In my opinion, The Chess Attacker’s Manual delivers three main values to the readers such as the quality of the game selection, a suggestion how to use computers to find tactical possibilities out of the opening (short, but valuable content) and a good number of tactical puzzles at the end of each chapter. The game selection targets a large range of chess players as stated by (GM Eugene Bareev in the foreword of the book).The process of choosing the right examples to illustrate the main themes in a chess book (or any chess training activity) is not a trifle matter. A careless game selection will frustrate the reader because a book can jump from too easy to very complex examples, or worse, the examples are unsuitable for the intended target audience. The widespread availability of personal computers and affordable chess engines allow chess amateurs to use software to improve as players. 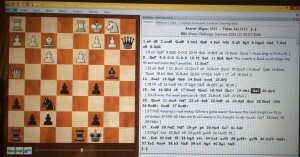 A chess engine can be a powerful tool when guide skillfully by a player. The tandem engine and player can discover tactical opportunities laying beneath well know positions. Song and Preotu illustrated how they use computers to work on openings and to get the advantage out of a well know position. The process is simple and effective. To my surprise, I was able to adjust the process to understand better the dynamics of complex openings like the Sicilian Najdorf (Poison pawn variation). 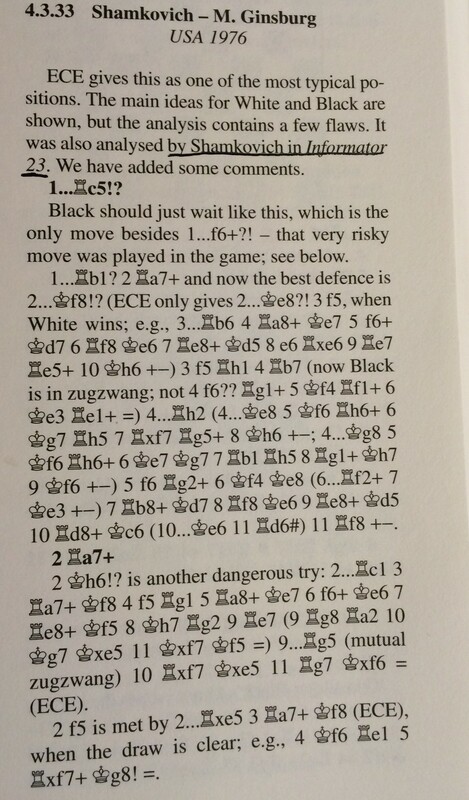 The Chess Attacker’s Manual has at the end of every chapter a set of puzzles to challenge the reader. The number and level of the positions are appropriated to the target audience. 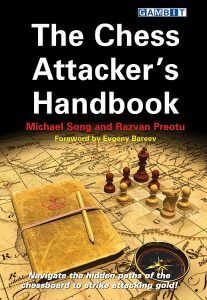 This primer on attacking chess is warmly recommended.